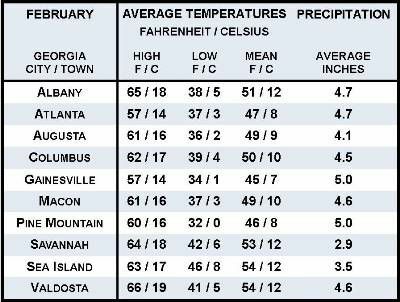 February Weather in the Southeast U.S.
February is one of the coldest average months of the year. Average high February temperature across the Southeast vary quite a bit, ranging from the mid-40s to the mid-60s, while low averages range from the mid-20s to mid-40s. Occasional glorious winter days may reach into the 70s, while other February days may bring winter storms. In the mountains, February typically continues to produce enough snowy days to make area skiers happy. In some years, coastal areas may experience a little bit of snow, but accumulation is normally minimal and short-lived. Average February Atlantic Ocean water temperatures rise slightly to the upper 30-degree marks around Virginia and into the mid 40 to high 50 degree marks around North and South Carolina. What Is January Weather Like in the Southeast? What March Weather Is Typically Like in the Southeast U.S.